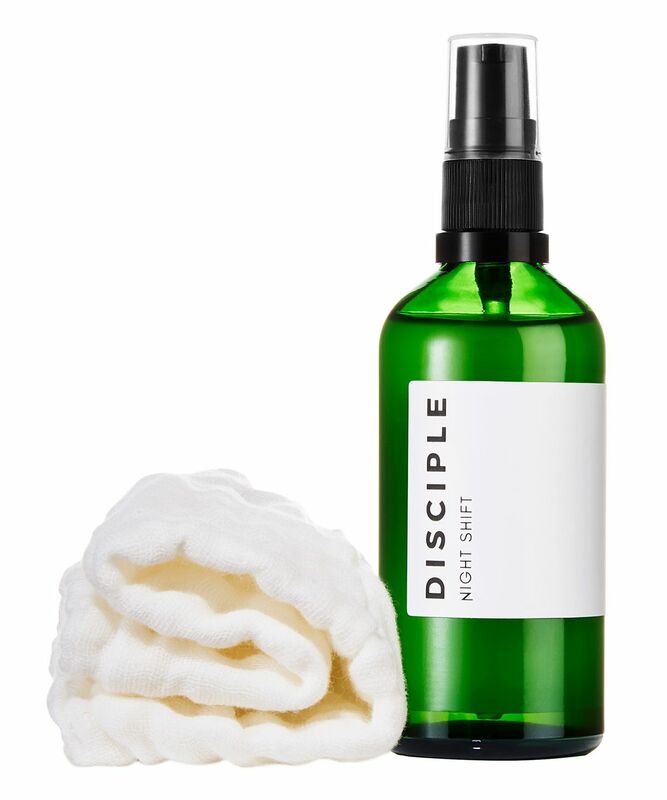 DISCIPLE Skincare was created with a simple aim: to ‘sort out’ stressed-out skin. Created by psychotherapist Charlotte Ferguson, these adaptogen-rich formulas work not only on the surface of the skin but internally too, improving your body’s ability to adapt to stress and helping to rebalance hormones. For the ultimate pore purge, this deep cleansing oil is formulated with natural alpha hydroxy acids (including lactic, glycolic and tartaric acids) and gentle fruit oils (including prickly pear and grapefruit oils) to exfoliate and maintain moisture levels. Hand-blended in small batches from the best raw botanical ingredients, DISCIPLE Skincare is the clean, streamlined range that every beauty buff wants to get their hands on. For the ultimate pore purge that won’t upset your skin’s delicate moisture balance, Night Shift Cleanser and Cloth is enriched with alpha hydroxy acids and nourishing fruit oils. Lactic, glycolic, citric, malic and tartaric acids exfoliate skin, encouraging cell renewal and dissolving the bonds binding dulling dead cells to your skin’s surface, to reveal the ‘new’ healthy skin cells underneath. Meanwhile, cactus oil maintains moisture levels, grapefruit extract provides anti-inflammatory effects and neroli oil helps to alleviate stress, aiding restful sleep and granting sublime natural scent. More than enough to ‘wipe the day away’, this lovely cleanser removes impurities and make up, although heavy eye make up may require a pre-cleanse. Shake well. Massage 2-3 pumps all over face. Apply the hot, wrung-out cloth to your whole face. Take a deep breath and allow steam to penetrate pores. Gently wipe the day away. Use SPF in the AM after use. It's paradise. It's amazing. I love it and use it day and night :) I need a whole box! It cleans away everything and smells beautiful. Using an oil to wash my face feels very odd and counterintuitive but I really like it and the cloth leaves my face so soft. Converted! Have tried all of the Disciple products now and not been disappointed with anything! The smell of this is just divine and it’s become my favourite cleanser, such a joy to use! I’ve only been using this for a few nights but OMG the smell. I used to hate washing my make up at the end of the day but now I look forward to it! Quite a small bottle for the price but I think it goes quite far. It’s a kind of milky oil. The flannel is beautiful and thick too which I love. I wasn't really expecting much from this cleanser and wow was I wrong. It is so lovely to use and smells so gorgeous. I feel like I am washing away my day when I use it. I am mostly using as my second cleanse as its too nice to use for just make up removal. It's getting more uses than my HG Emma Hardie cleanser which really says something. The bottle may be on the smaller side but it goes a long way. This is an absolute pleasure to use! Everything about this cleanser is luxurious; the smell is divine, the texture is lovely and it melts makeup very easily. I now look forward to my evening cleansing routine, and will no doubt try more disciple products in the near future, as my skin has never been in better condition. Highly recommended. This is a very nice formula and feels much more expensive than it is. I find some cleansing oils sink into the skin too quickly, but this has enough 'slip' for a good massage. The smell is delightful; very fresh and green. I didn't experience any irritation from this and now use it on my eyes, too (I use a micellar water first). My only slight niggle is that I do wish it emulsified to rinse away more easily as I find using a cloth a bit of a faff, but otherwise it's really lovely. Really nice cleanser, smells amazing.